SCENE: The Editor’s office early in 2013. There is a desk in the centre of the room. There are two chairs either side of the desk, a big one and a small one. Editor sits in the big chair, Sub-editor sits in the smaller one with a laptop. Editor puts a piece of paper on the desk. The piece of paper has a crossword puzzle printed on it. Editor: Well that’s 16th November sorted. What have we got available for the 23rd? It’s the last mathematical of the year. Sub-editor types furiously on his keyboard. Sub-Editor (reading off screen): “The first episode of the science fiction television series ‘Doctor Who’ was broadcast in the UK. It is the longest-running and most successful science fiction TV series in the world.” Well, we could commission a special mathematical around the equation of space-time and the twelve dimensions. Elap could write a computer program to work out the interspatial vertices. Editor: OK, I’ll send him an email tomorrow. Sub-editor: What are those two envelopes doing in the in-tray? Editor: That’s odd… I didn’t think we had an in-tray. Editor takes the two envelopes out of the in-tray and opens the first one. Editor: It’s a mathematical puzzle from Oyler. Sub-editor: Well that’s lucky. What does he have to say? Editor (reading a letter): He says it’s the 600th anniversary of the founding of the University of St Andrew’s, this year and he’s enclosing a puzzle he’s done to celebrate it. He’s also suggesting that publishing it on 30th November would be good as that’s St Andrew’s Day. Sub-editor: That wouldn’t work… everyone’s just got used to the mathematical moving to the penultimate Saturday of every third month. Editor: You’re right. I’ll reply that it would be too confusing. Sub-editor: What’s in the other envelope? Editor: It’s a puzzle from Ilver. He says it’s the 50th anniversary of Doctor Who on 23rd November this year and he’s enclosing a puzzle to celebrate it. (He pauses.) Oh well, it looks like we’re destined to confuse everyone. I’ll schedule them for the dates they’ve suggested. Sorted! Sub-editor: Where’s the in-tray gone? Any similarity to actual events is in the realms of science fiction. Fast forward to November 2013. Well, they weren’t going to surprise me this week… I was ready for the quarterly mathematical puzzle. It was just a shame that it fell on 23rd November, the date of the anniversary of Doctor Who that the BBC had been flagging for most of the year! Never mind, I got to blog Stick Insect’s EV puzzle, Distortion, and Nimrod’s IQ, combining the 50th anniversary of JFK’s assassination the day before. Upon opening the paper, I had the same sort of feeling as I did with Mr Magoo’s domino puzzle, except that had a grid that seemed too small for a normal puzzle and here it seemed too big for a mathematical. A quick read of the preamble, ending as it did “thus completing a representation of the transport in that row”, and I realised we were indeed in Doctor Who country, the transport being the TARDIS. The unfortunate thing was that I probably had a lot of cold solving in front of me. Moreover, certain clues (as seems common these days, we weren’t told how many) had an extra wordplay letter, but they shouldn’t be too daunting. Luckily, the clues, all good, were pretty straightforward, but it took me about an hour to finish my first pass through them. Not that that bothered me… I had solved over 40 of them, and the grid was coming along nicely. 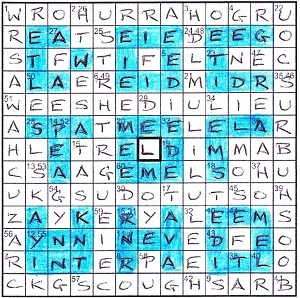 I’d even managed to get the message spelt out by the extra letters: Count a letter in each of remaining clues. All that was in the first run of clues, with the rest not having any extra letter at all. How wonderfully sneaky! Moreover, the clues without an extra letter numbered 26, so it was obvious that something needed to be done with them, one for each letter of the alphabet. It wasn’t much later that I had a full grid, and the instruction had to be interpreted. My initial thought was that we had to count the occurences of each letter of the alphabet in the clues in order. Unfortunately, the F in row 2 column 1, had to be surrounded by four shaded cells and that conflicted with the W in the top left corner which would be surrounded by none. I tried various other possible interpretations, including trying to find one particular letter whose appearance in each clue indicated how many shaded squares there were. Nothing worked out. It wasn’t too long before I checked my four word chains and discovered that I hadn’t finished the top left corner correctly. Indeed, the end of stage 6, REALTER didn’t appear properly at all. Stupid boy! My first instinct about counting each letter of the alphabet in order proved correct, and I built a new grid containing the numbers 0 – 4 and corresponding to the number of shaded squares that should surround each one. This stage proved a little bit tricky, but was very rewarding when it all worked out correctly, and there in front of me in large letters was DOCTOR WHO. Obviously L, for 50, needed to be slotted in the central square to reveal ETRELDIMM, ie T (time) & REL (relative) DIM (dimension) in EM (space), which is what TARDIS stands for. Thanks, Ilver, for a superb (and not too tricky) implementation of a wonderful anniversary. This entry was posted on 13 December 2013 at 5:00 pm	and is filed under Solving Blogs. Tagged: Ilver, In-tray, Journey to the Centre. You can follow any responses to this entry through the RSS 2.0 feed. You can leave a response, or trackback from your own site. Tut tut! There’s no apostrophe in University of St Andrews!!! Alastair, thanks for the slap wrist. I’ll be sure to get it right next week.